← Nikka "from the barrel"
This rum swirls on the tongue violently like a cyclone, forcefully spitting out diverse and robust flavours that electrocute the taste buds like a lighting bolt. For a rum of this strength (75.9%, so be mindful of this! ), it is very smooth. I highly recommend this rum for seasoned spirit tasters, and those who are serious about unpacking a complex and very special rum. There is something quite special about a high quality distillate, untouched and at cask strength, that showcases the essence of cane sugar. This rum has an energy and spark that I have not encountered with other rums. It is sensational. As I say below, it EXPLODES on the tongue like dynamite on a runaway train. It releases diverse flavours with lots of character and depth, and it is very intense. Perfect for seasoned spirit tasters looking for some clout and complexity, or some more hair on their chest! The Holey Dollar Platinum Label is a cask strength rum at 75.9% alc/vol. Holey Dollar also produces two other rums, the Gold Label and the Silver Label. It is distilled in pot stills and aged for three years. Made from Fijian sugar cane, it is crafted as a recreation of the rum that was used as currency during early settlement of Australia. You heard correctly! Rum was used as a currency in the Australian colonies. 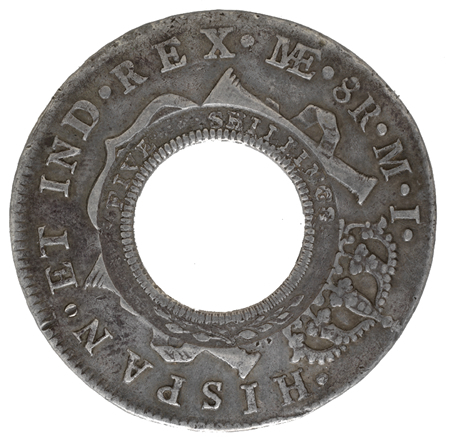 Also used as currency due to shortages in coin were Spanish coins with a hole punched through them, the “holey dollar”. It was a rough ride for the early Australian settlers. Barter was the most common way to make transactions because there were lack of coins, so people commonly swapped commodities like rum to keep the economy moving. Rum was therefore viewed as currency! Rum was popular in the colonies of Australia, and European settlers and their mateys would chug down lots of rum. This caused problems relating to drunkenness (I see not much has changed in the colonies!). 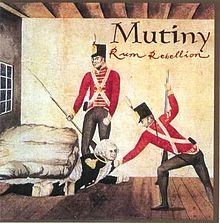 Gov William Bligh attempted to outlaw the use of rum as a currency, and this, some think, sparked the “Rum Rebellion” in 1808 (in reality its cause was much more complex!). The result was the arrest of poor Gov Bligh by the New South Wales Corps who maintained control of the colony until Gov Lachlan Macquarie arrived in 1810. Like the United States and Canada, Australia is a federation. After the colonies federated in 1901, the federal government passed in 1910 the Notes Act and in 1913 the first Australian money notes were issued. Now we used moolah to buy rum! 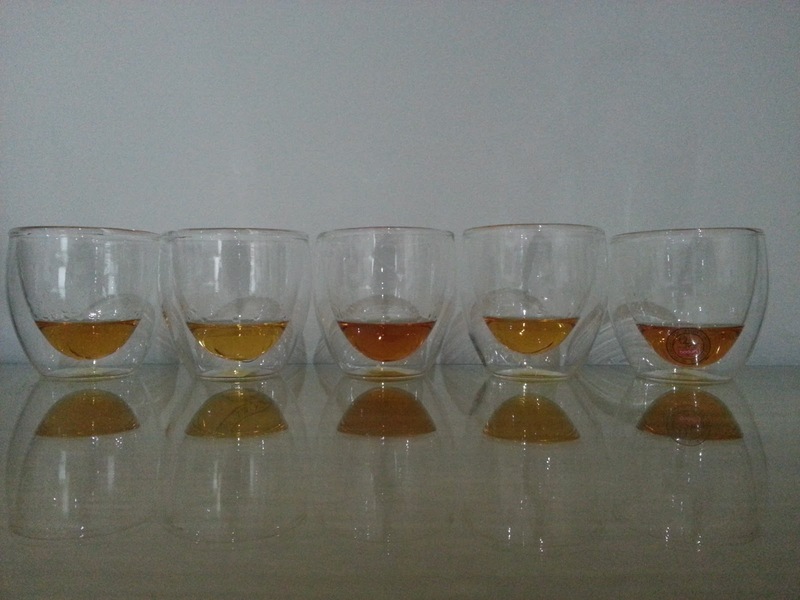 I blind tasted the Holey Dollar Platinum label alongside other rums, including the Flor De Cana 4 Year Old, the Mount Gay Extra Old, Pusser’s Rum, and a 50:50 mix of the Holey Dollar Platinum and water. I could not identify what I was tasting, and the below notes (and my above recommendation) is the result of blind tasting. Sure, this rum has 75.9% alcohol but remember this tasting included this rum neat and this rum with water! These tasting notes are based on both. Sugar cane wafts up with ripe banana and sugary dried paw paw and apricot. These are moderated by bitter dark chocolate, oak and under-ripened green papaya as the fragrance of toasted coconut and raisins/prune sneaks in with the zip of passion fruit. Here comes that cyclone! How can something so violent be so gentle? This rum EXPLODES on the palate like dynamite on a runaway train. Speaking of rebellion, it fires away like an angry Ned Kelly in a cloud of gunpowder and smoke. Being totally blown away by the first sip, I dust myself off and take a second sip. That massive burst of flavours energetically races through my mouth and up my nose, though without harshness. Toasted oak and ashes come with a burst of fire glowing with spice, as sultana and banana add some sweetness to bitter dark chocolate, ground coffee and bitter wet tea leaves. Oh, that glorious sugar! It reminds me of an unrefined Latin American raw sugar, panela. It is smooth on the tongue, just like panela (evapourated sugar cane juice), as glucose and fructose melt into the taste buds. Sensational! That alcohol is also clearly evident!! It is dry on the tongue with gushes of luscious oil, though this viscosity quickly disappears leaving the palate moderately dry. The finish on this rum lasts for a very long time, leaving a vapour that takes its time to evapourate from the tongue. 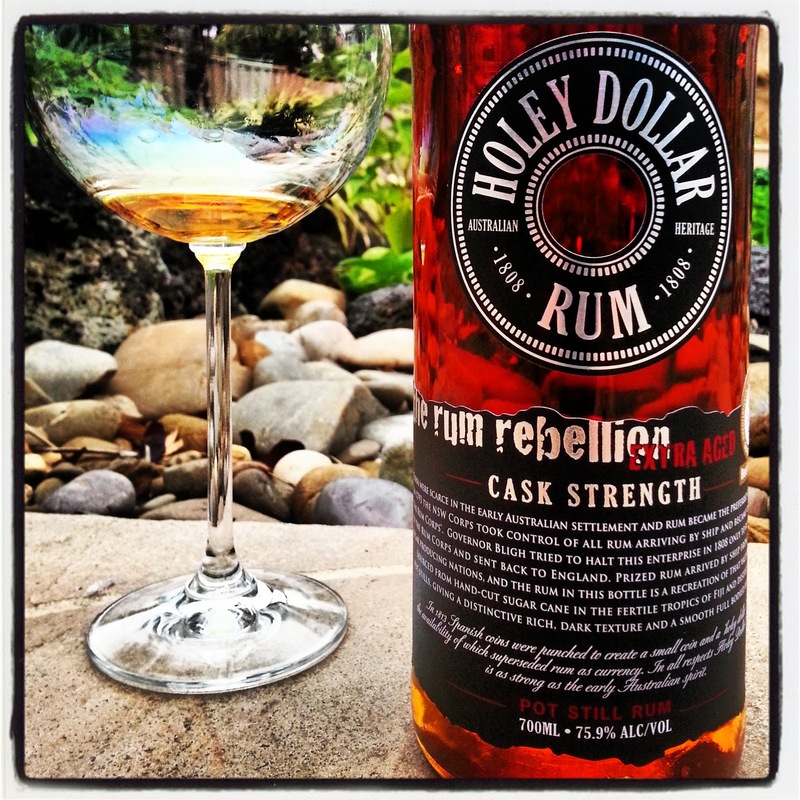 Congratulations to the Holey Dollar Distillery for producing a sensational rum.